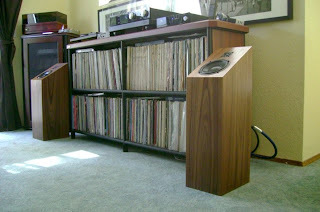 Dan Muzquiz of Blackbird Audio just posted these pics of these Heed Audio speakers on his Facebook page. I've been using the Heed Audio Obelisk SI integrated amplifier and X2 power supply for a month or so, and I have to say this Hungarian company really knows how to make great hi-fi. These Heeds use Morel drivers, and Dan reports that they "imaged really big (tall) and were really forgiving with the sweet spot too," adding that they were really fun to listen to. There's no price on these yet since Heed is still trying to figure out these can be marketed competitively in the US. Since the Heed amps I'm using sound utterly fantastic for their relatively modest price, I bet these will wind up being bargains. They remind me a little bit of Shahinian speakers. I'd love to hear them! NOTE: Dan just informed me that these are just older pics from about two years ago that he's recycling on his Facebook page. I'll try to get an update on whether or not these will be available in the US.